On July 2nd, Canada’s first Master Sommelier, John Szabo, released his report: Austria’s Best Whites – The Latest Report from Central Europe (originally printed on Wine Align’s Blog.) John knows his stuff and as an attendee of this year’s VieVinum and an avid Austrian Wine supporter, we’re sure you’ll want to take his advice and pick up some of these selections today! The Austrians know how to put on a good show. The biannual VieVinum event took place this year from May 28-31 in the majestic court palace rooms of the Wiener Hofburg in downtown Vienna. Over 850 international journalists, importers, agents and sommeliers were invited to Vienna to taste as assess the recent vintages and get an up-to-date picture on the Austrian wine scene. In total, over 14,000 wine enthusiasts from all over Austria took the opportunity to taste the new vintages from Austrian wine producers during the three-day event. From nearly zero in the mid-eighties, Austrian vintners have enjoyed a near-constant increase in exports over the last 25 years. Exceeding all expectations, even in the last troublesome couple of years exports of bottled wine (87% of total exports) have continued to grow, particularly in value, up 4.4% from last year. Germany is still the most import market by a large margin at nearly 60% of all exports. Sadly, Canada does not even figure in the top ten list of export destination countries, a pity given the extraordinary quality of the recent releases. One can’t even blame the LCBO for lack of availability, as a quick scan of available Austrian wines reveals an impressive collection of some of the most sought after names currently on sale in Ontario. I can only surmise that it is simply lack of awareness about the beauty of these extremely versatile and food-friendly wines that relegates them to the dark corners of the Vintages Shop Online program and the occasional dialed in agent who’s ahead of the learning curve. Why aren’t Canadians buying more Austrian Wines? Austrian wine production is dominated by white wine, with white grape varieties representing over 68% of total vineyard plantings (latest stats from 2007). 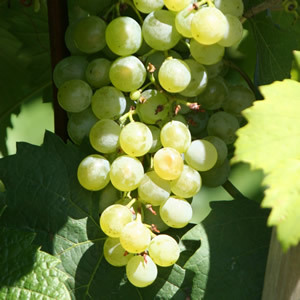 Of these Grüner Veltliner (or “grooner, or ‘gru-vee”) is easily the flagship grape, accounting for nearly 1/3 of all grapes planted. (Riesling, though represented on only 3.6% of vineyard acreage, qualifies for me as Austria’s second most important white grape in sheer qualitative terms.) Grüner is an amazingly flexible grape that comes in a range of styles from light, bright and peppery to rich, lush and full bodied. Most are aged without recourse to oak, allowing purity of fruit and mineral flavours to shine through. I’ve done considerable experimentation matching grüner with food, and I find it to be one of the most friendly and flexible wines out there. From classic European-style fish and seafood preparations to sushi and sashimi, Thai, Chinese dim-sum and lightly spiced Indian curries, grüner seems to handle it all with aplomb. Just ask Vikram Vij of the celebrated Indian restaurant Vij’s in Vancouver (a certified sommelier). “We prefer fresh, crisp whites without too much oak”. Enter grüner (and a fine collection of German white, too). My experience consulting on the list for the Aman Patel of the Indian Rice Factory in Toronto led to much the same conclusions. To find the top kit, look to the trio of appellations bordering the Danube to the west of Vienna, north of the River: Wachau, Kremstal and Kamptal. With variations in elevation, aspect and most importantly soil type, the grüners from these areas can be astonishingly mineral-flavoured or succulently juicy with lively citrus and stone fruit (green peach, apricot). The signature of the grape, however, is a totally unique herbal-spicy-vegetal nuance that many liken to white pepper, though I’m most often reminded of turnip, parsnip or even fresh lentil flavours as well as sweet green herbs like tarragon or basil. Whatever the case, these are some of the most original wines in the world. The historic vineyards of Austria share a philosophical link with Burgundy and Germany, in that over the course of centuries, specific vineyards with marked individual character have been identified, named, vinified and bottled separately in order to highlight the terroir. It’s not surprising given that Cistercian and Benedictine monasteries have been established in the Danube River Valley for nearly a thousand years. Monks, with their envious spare time, affinity for contemplation and singular purpose of exalting God through their work, were well positioned to dissect the land and champion each vineyard’s individual character. And grüner veltliner, like pinot noir and riesling, is a perfect vector for articulating the land. Some of these monasteries have been making wine continuously for centuries, such as the Stift Göttweig (11thC) and Schloss Gobelsburg (12thC). Trockenbeerenauslese: “dried out selected grapes”, ie. Botrytis affected, resulting, confusingly, in very sweet wine. Ried: “single Vineyard”. The name following the term ried refers to the name of the vineyard, as in “Ried Lamm”, where Lamm is the name of the site in which the grapes are grown. 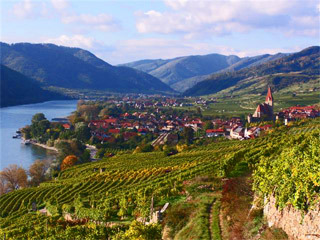 Steinfeder, federspiel, smaragd: three terms exclusive to the Wachau region, referring to increasing levels of ripeness. Steinfeder describes the lightest style, usually with about 11.5% alcohol, moving up the scale to smaragd, the most full bodied wines often tipping in at over 14% alcohol, with corresponding intensity of flavour, body, etc. Terrassen: “terraces”. The steepest parts of the Danube Valley have been carved into terraces in order to make winegrowing possible. Terraces help to reduce erosion and make vineyard management a little easier. Berg: “hill”. Often used in conjunction with a vineyard name, as in Käferberg or Loibner Berg. These steep sites offer excellent drainage and sun exposure, yielding excellent quality wines. In order to be labeled as bergwein, the site must have a slope of at least 26º (subject to verification).